The 16 un-buffered (pass-through) outputs and 16 buffered outputs may be connected to acquisition hardware like the NI Dynamic Signal Acquisition Module. 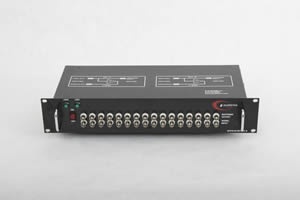 This device enables test engineers to connect external measurement instruments to the system for additional measurement functionality or diagnostics without affecting the process measurements on the primary system. The box dimensions are 19” wide x 7.25” deep x 3.47” high. Power comes thru an IEC320-C14 standard inlet with a range of 88-264VAC and 47-63Hz. Power consumption is typically 8 watts. The Dynamic Signal Buffered Splitter supports two sensor input ranges: +/-15 VDC or +/-30 VDC. 3dB bandwidth is DC-200KHz. For customers needing additional functionality, G Systems also provides hardware and software customization services. View our capabilities brochure for more information. Would you like to learn more? Are you ready to get started? Enter your email and we'll contact you.